I met Katja at Barleylands Farmers Market near Billericay. She was selling various smoked goods, of which some – sea salt, garlic, cheese – looked weird, but whole trout caught my attention. Katja told me it can be eaten cold or heated up and served with potatoes, the latter of which I found a bit surprising. In the end I tried it cold, on a sandwich with home-made sourdough rye bread, and it was glorious. I kept coming back every two weeks just to buy the trout. Eventually I sold the car, but kept coming on a bike, 30 minutes each way via busy roads – for the trout. One weekend we even rode up to Stock to visit the smokehouse and see how the trout and other smoked food is actually prepared. When I learned Hanningfield Smokehouse – that’s what Katja and Colin’s company was called – have an online shop and do deliveries, every couple of weeks I ordered the trout (three packs for £24, to qualify for free delivery), and Katja, or sometimes Colin would drive up and bring the fish in a styrofoam ice box, usually leaving it behind the garden gate, as noone was home. Then, this July, I received an email from Colin. They were going to shut down for three weeks, as Katja was unwell and needed to go to a hospital. Then, came August, a trip to Japan, lots of work with building bedroom furniture, and it was September when I realised it’s been two months since I last had my favourite sandwich topping. In response to my inquiry about the status of the business and Katja’s wellbeing, I received sad news: after spending eight weeks in a hospital Katja is finally back home and recovering, but in the present situation the couple cannot carry on running the smokehouse and are looking to sell it. I can only thank Katja and Colin for the ultimate pabulatory pleasure they have been providing me with over that last few years and wish them all the best wherever life takes them next. 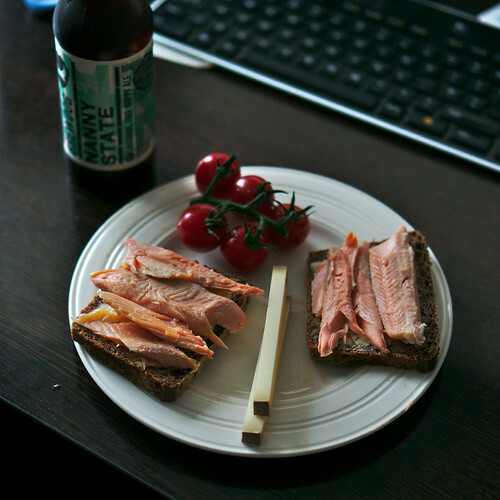 What remains for yours truly are the remainders of the perfect supper combination: sourdough rye bread, butter, Hanningfield Smokehouse hot smoked rainbow trout, Tesco Finest piccolo tomatoes on the vine (ones produced by Thanet Earth in Kent), and a bottle of Brewdog Nanny State – sans the trout. As everything else can be bought in Tescos, let us focus on the bread. I first got the sourdough starter from my in laws in 2009, I think. Since then I shared it with friends, used all up when we went away for two months, got a portion back from the friends upon return, and for more than five years now I have continuously been keeping the sourdough, refreshing it every now and then while making a new loaf. Someone I know – I won’t go into details, in case US CBP scrapes the internet for bits of incriminating information on individuals crossing the border – once took a small jar of the dough with him when traveling to the US. It was for a Polish friend who lived in rural Tennessee, and had to suffer what passes over there for bread. When filling in the customs declaration form, he neglected to declare the presence of lactobacilli colony in his baggage and thus managed to smuggle the starter. It then spread across many households in Oak Ridge area, and I would not be surprised if it is still in use in some form until this day. First mix all of dry ingredients in a bowl, then add the starter and mix, finally add the water and mix well. No need to knead. The consistency should be perhaps not quite watery, but more liquid than you would normally expect from a yeast dough. Leave to rest for 3-4 hours, covered with a kitchen towel. Then save a few tablespoons of the dough as the starter for the next batch and transfer the rest to the baking tin, which has been previously greased with butter and covered in breadcrumbs. Let the dough raise for further 3-4 hours, then place in a 180C oven for an hour and a half. In practice I often prepare the bread in the evening, transfer the dough to the tin around 10 PM and program the oven to finish the hour-and-a-half baking cycle at 7 AM. Let me know if you need some sourdough starter, I’ll be happy to share. And let me know if you find a good smoked rainbow trout anywhere.